Sen. Joe Manchin awards Private Wetzel “Sundown” Sanders a Purple Heart Friday in the Marshall Recreation Center. U.S. 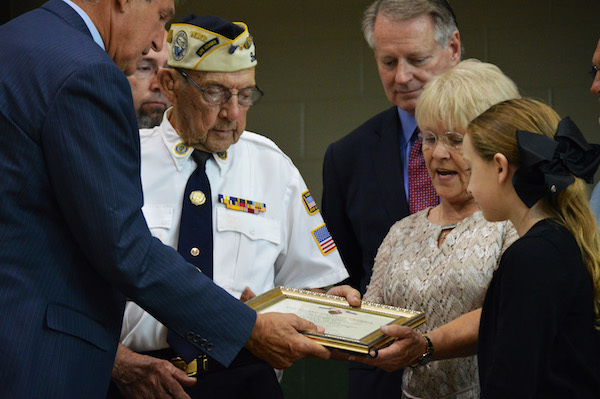 Senator Joe Manchin awarded Private Wetzel “Sundown” Sanders with a Purple Heart Friday in the Marshall Recreation Center for wounds Sanders received defending Pearl Harbor against attacks from Japan nearly 76 years ago. Sanders, 94, of Lincoln County, was hit with shrapnel in his right knee while repelling Japanese fighter planes’ attempts at attacking Hospital Point at Pearl Harbor. Despite this, Sanders continued to fight back and went on to spend a total of almost three and a half years fighting during World War II. Senator Manchin secured the Purple Heart for Sanders this month to honor him for the injury he sustained at Pearl Harbor and for his service that had long gone unrecognized. Manchin said the presentation did more than honor Sanders; it brought the community together, regardless of political or social differences. Hunter Bellamy, ROTC cadet battalion commander and Marshall senior, said he was glad to see this unity play out between students, citizens, veterans, Marshall administrators and political leaders alike. Bellamy said he hopes to see more events like this take place to give thanks to members of the military whose service might otherwise be overlooked. Sanders said he was glad to have served, and he thanks the Lord every day for all he has received. Sanders is one of two remaining Pearl Harbor survivors in West Virginia. Marshall President Jerry Gilbert, Huntington Mayor Steve Williams and West Virginia National Guard Adjutant General Jim Hoyer were among the additional speakers at the presentation.